Economic history is an interdisciplinary field that fuses economics with history, two disciplines that often misunderstand one another. This chapter bridges these two disciplines by discussing archetypical approaches and research strategies in each. The authors contrast the differences between deductive, inductive and abductive reasoning in scholarly enquiry. They conclude with a call for consideration to (historical) context when conducting research in economics and economic history. We thank graduate students at Queen’s University Belfast for the lively seminar discussion that underpins this chapter, and Graham Brownlow, Rob Gilles and Tom Hulme for comments on an earlier draft. Austin, Gareth. 2017. Three Revolutions in Economic History. Inaugural Lecture, University of Cambridge, 20 October 2017. http://www.econsoc.hist.cam.ac.uk/podcast-austin.html. McCloskey, Deirdre N. 2018. Economic History as Humanomics, the Scientific Branch of Economics. Paper presented to the Allied Social Science Association Annual Meeting 2018, Philadelphia. 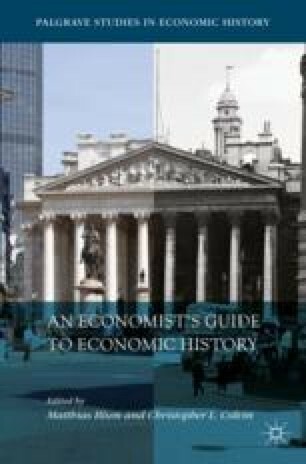 http://deirdremccloskey.com/docs/pdf/McCloskey_EconomicHistoryEssayASSA2018.pdf.